Attack, potentially timed for Rosh Hashana, would have involved 200 heavily-armed terrorists and been on an unprecedented scale. Hamas terrorists inside Gaza "terror tunnel"
The IDF has confirmed rumors, circulating since last summer's war with Gaza terrorists, that Hamas was planning a massive attack on Israeli communities by hundreds of terrorists who would infiltrate into Israel via the vast network of "terror-tunnels" dug from Gaza into Israeli territory. In an exclusive Vanity Fair report, IDF spokesperson Lt. Colonel Peter Lerner finally revealed that in destroying the tunnel Israel may have prevented a coordinated massacre of its civilians on an unprecedented scale. "Hamas had a plan," he said. "A simultaneous, coordinated, surprise attack within Israel. They planned to send 200 terrorists armed to the teeth toward civilian populations. This was going to be a coordinated attack. "The concept of operations involved 14 offensive tunnels into Israel. With at least 10 men in each tunnel, they would infiltrate and inflict mass casualties." An unnamed senior military intelligence figure elaborated further on how the attack was meant to pan-out: "First, get in and massacre people in a village. Pull off something they could show on television. Second, the ability to kidnap soldiers and civilians using the tunnels would give them a great bargaining chip." Information about the plan was pieced together by an intensive Israeli intelligence operation, including "electronic intercepts, informants, interrogations of Hamas operatives, as well as computers and satellite imagery obtained from Hamas compounds during the war," according to the report. Among the evidence, Lerner said high-resolution maps pinpointing potential sites in Israel, including civilian areas, were seized by soldiers. Hamas's political leader Khaled Mashaal admitted to Vanity Fair that the tunnels were seen as a way of gaining the upper hand over Israel, which had effectively minimized the threat posed by rocket-fire via the Iron Dome missile defense system. "In light of the balance of power which shifted towards Israel, we had to be creative in finding innovative ways. The tunnels were one of our innovations. As they say, necessity is the mother of invention," he said. According to the Israeli Security Agency (Shin Bet), Hamas began building "crude" tunnels under Gaza as early as 2000. But the breakthrough came with the kidnap of IDF soldier Gilad Shalit, and the subsequent one-sided prisoner-exchange deal with Israel in which 1,027 terrorists were released. "This was a proof of concept for them. 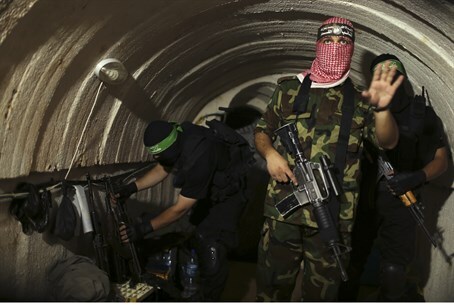 Tunnels work," said a top Israeli military official. After that, Hamas created "a secret commando unit", dubbed Nukhba (the “selected ones”), to train terrorists "to fight and maneuver through the tunnels on foot and on small motorcycles." "They were an elite force... [trained] to execute strategic terrorist attacks... [For the eventual operation, they would be] heavily armed: R.P.G.s, Kalashnikovs, M-16s, hand grenades, and night-vision equipment," a senior Shin Bet official said. Terrorists also possessed IDF uniforms in order to launch surprise attacks. Regarding rumors that the planned massacre was meant to be timed for Rosh Hashanah, the Jewish New Year, a top intelligence official admitted it was a possibility - but that Hamas had changed its plans after the kidnapping and murder of three Israeli teens in June sparked an escalation in hostilities with Israel. "It may have been, but ultimately everything was moved up. Hamas’s grand plan for the tunnels failed because the kidnapping set things in motion before Hamas had everything ready." After initially denying (but praising) the abduction and murder of Naftali Frenkel, Eyal Yifrah and Gilad Sha'ar, Hamas eventually took responsibility for the attack. However while that "operation" was ordered by senior Hamas leader Salah Al-Arouri, it was evidently not coordinated with the group's military command in Gaza. Khaled Mashaal admitted as much in the interview, explaining that individual terrorist cells in Judea and Samaria are given a significant degree of autonomy in the kinds of attacks they carry out. "It turned out that a Hamas field group in the West Bank had killed those three settlers. This was a legitimate operation . . . [but] we never gave orders to execute this operation, or to stop that one. We present general policies." But even after the tunnel threat has been neutralized in the south (at least for now), the IDF has immediately turned its attention northwards. As recent Arutz Sheva reports have noted, the IDF is seriously concerned that Hezbollah - which is known to possess an extensive network of tunnels inside Lebanon - is digging its own "terror tunnels" into Israel to carry out attacks against communities and military outposts along the northern border. Despite trying to play down the threat, the army is actively working to scour the region for signs of such tunnels by Hezbollah - signs which some residents say couldn't be obvious, with some reporting clearly hearing the sounds of heavy digging equipment from the ground beneath their own homes. Syrian rebels have also been learning from Hamas's success, using tunnels with increasing frequency to target static Syrian regime positions - and to at least some extent they were aided in their efforts by Hamas operatives. As one rebel commander put it: "They said they had some success in Palestine, so I decided to try it."